A tasty Sunday evening long form improv treat. 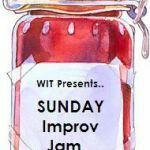 Take 1 helping of Wellington improv comedy talent, add audience suggestions; mix in a theme. Let bake for 60 minutes. Serve chilled. Comedy that’s raw and loose with a minty taste! This entry was posted in Other formats, past shows on February 8, 2009 by MaDmin.